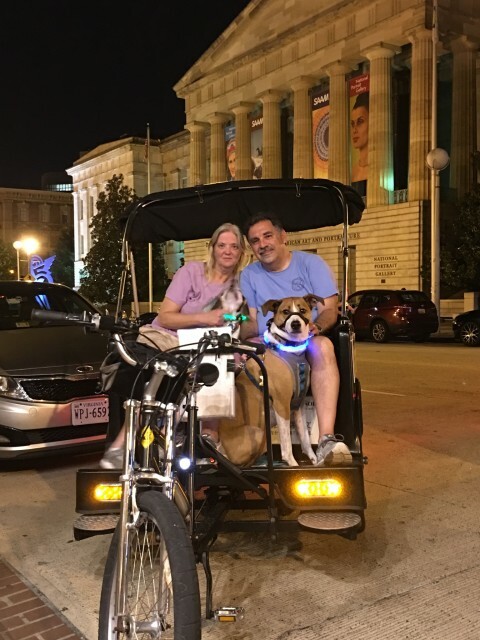 Are You Looking for a Dog Friendly Private Tour of Washington DC? If you have your dog with you in DC, it is very hard to find a tour to see the monuments. The bus tours won’t take you. Bike tours won’t take you. Segway tours won’t take you. Tours in private vehicles generally won’t take you. It seems like you’re plum out of options. Nonpartisan Pedicab will most certainly take you! We love dogs. We love dogs so much that your dog rides for free on all our tours! 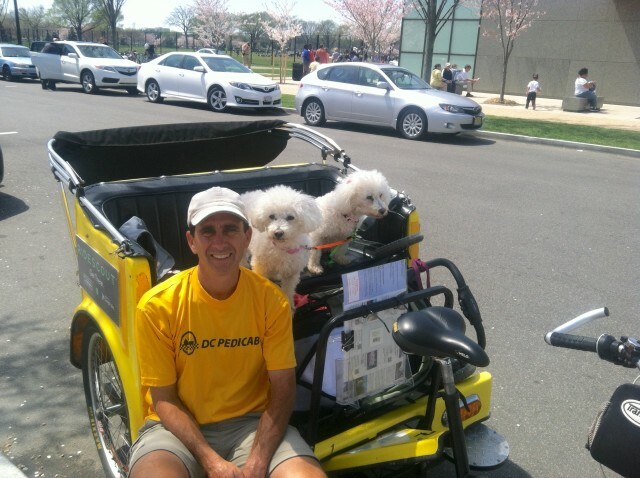 What are the benefits of taking a dog friendly private tour of Washington DC with Nonpartisan Pedicab? Take your dog with you into each memorial or leave them with us. Either way, no problem. What monuments will we see on a private tour of Washington DC? 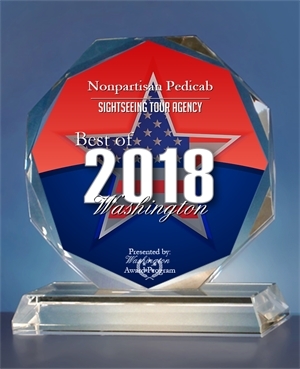 You can enjoy the best Washington DC sightseeing on a tour of the monuments with Nonpartisan Pedicab. Can my dog come with me when we go into each memorial? Short answer is yes. Long answer is not officially. Officially, only service dogs would be allowed into each memorial. Practically, this is rarely enforced. When enforced, it is never very confrontational. You might be asked to leave the memorial in a friendly manner. 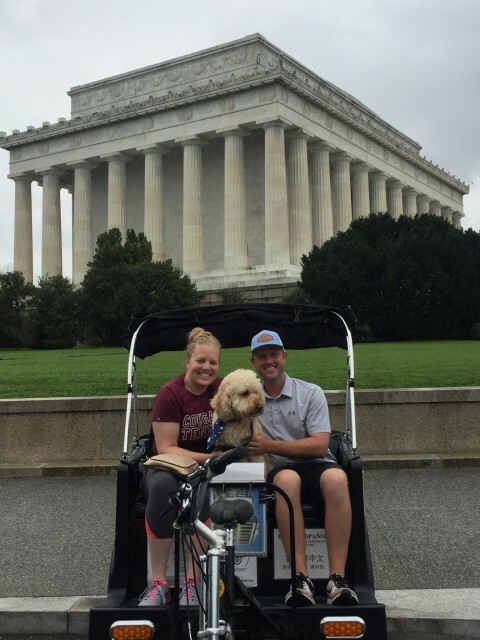 Can I leave my dog on your pedicab as I go into the memorial? Yes. Of course. Take your time. No problem. 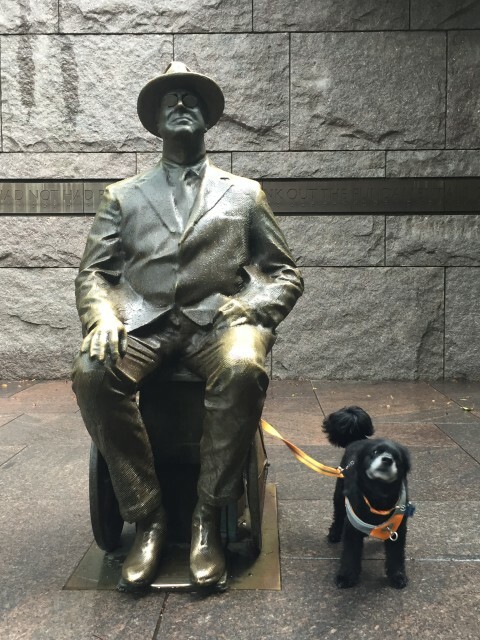 How much does a dog friendly private tour of Washington DC actually cost? We only charge for humans. Dogs always ride free. If you have two humans in the pedicab, the rate is $94 per hour, pro-rated to the length of your tour. A more full description of our pricing can be found at our tour rates page. Has Nonpartisan Pedicab won any awards or have an reviews? Heck yeah! 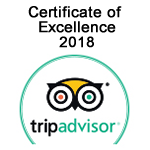 We have over 300 5 star reviews on Tripadvisor, 70 reviews on Google, 35 reviews on Yelp, and several reviews on Bring Fido, a dog friendly travel site. Click on the Nonpartisan Pedicab review page to see what everyone is saying about us. The best things is that even though we have been in the tour business for many years, we still have had exactly zero bad reviews! 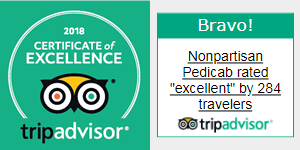 Nonpartisan Pedicab Won the Certificate of Excellence from Tripadvisor from 2016 through 2019. Go to our Reservations Page and book your tour today! 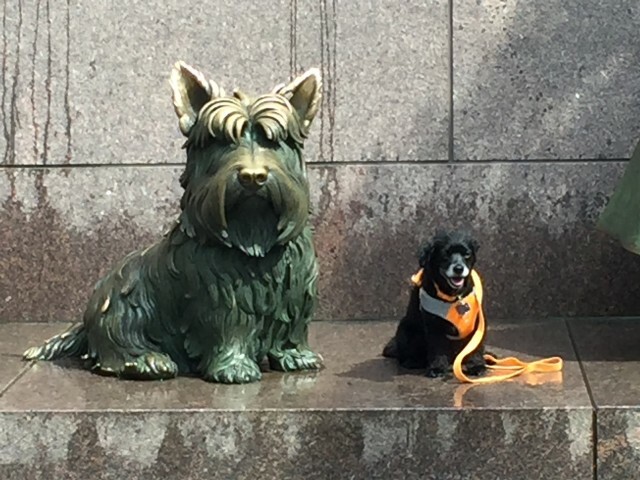 Washington DC Dog Friendly Tours are our specialty.